For homeowners and businesses throughout suburban Chicago’s Fox Valley area, Mendel Plumbing and Heating specializes in a wide range of commercial and home maintenance services. Whether you need electrical services, someone to remodel your property, or an additional installation project, we can help. Even better, on every job, you can expect the same high quality of work and care that defines our trusted name. The range of services we provide not only includes heating, cooling and plumbing, but also electrical, remodeling and maintenance support. When you schedule service with us, count on our team to work toward 100 percent satisfaction for you. Our growing family of technicians and maintenance personnel place a high value on delivering the best possible, personalized support. Electrical and generator services: Whether you need new fixtures and outlets installed or help with remodeling or rewiring work, our electrical experts are second to none. We handle everything from security lighting to generator installation. Remodeling — commercial and residential: When you need remodeling work at your home or business, we have the team of fully trained carpenters, electricians and plumbers who will get you exactly the finished look you want. Our services include complete bathroom remodeling, complete kitchen remodeling and any type of partial remodeling in your home. Talk to us about installing new windows and doors, updating the lighting, replacing a shower or custom tile work. Home services — home maintenance, filter delivery, salt delivery: Other jobs you can entrust to our team include maintenance on filters, carbon monoxide detectors, light bulbs, etc. To help you stay up to date on your home filters, we can get you on a subscription service to have new ones regularly delivered to your door. Likewise, to save you the trouble of lugging salt bags home from the store, we offer water softener salt delivery straight to your residence. 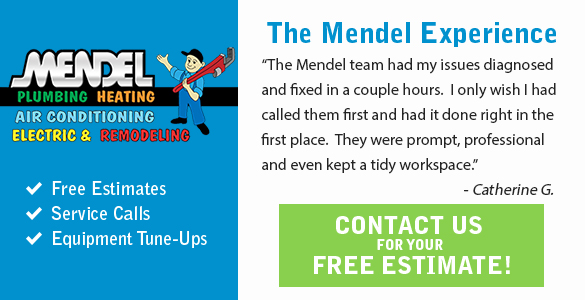 Here in the Fox Valley area, Mendel Plumbing and Heating is the No. 1 resource for staying on top of maintenance at your home or business. That’s because our company stands out in the industry for an unsurpassed level of attention and support. We are committed to doing every job right, listening to your desires, and earning your trust. Join the tens of thousands of satisfied clients we’ve already served in Chicagoland. Contact our team to set up a home service. Schedule Business Or Home Maintenance Service Today!